We offer the best bicycle tours in Central Florida! Group bike tours can be arranged for any size group, and are appropriate for all ages. Tours can be arranged to any trail in the area, and can range from 2 hours to 3 days. For pricing and other details, please contact our Event Coordinator. 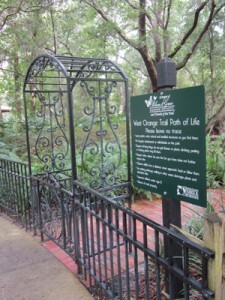 The West Orange Trail is Orlando’s longest paved rail-trail. 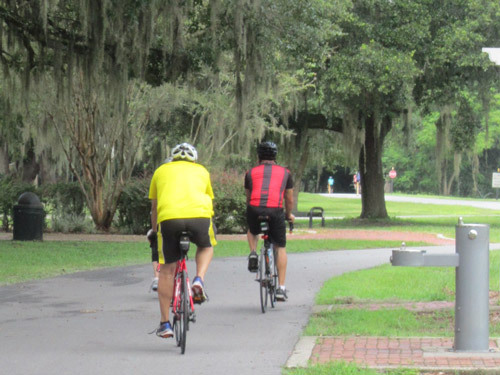 At 24 miles there are a variety of touring options from 2 hour leisurely rides to see the Antique shops in downtown Winter Garden, to fast paced road rides along the length of the trail. Our most popular tour along the trail, is our guided historical Winter Garden Tour. Partnering with the Winter Garden Historical Museum, we have a knowledgeable museum representative narrate the goings on along the trail. This includes the areas Orange grove and agricultural history, the areas tourism history as a famous bass fishing destination, and the areas rail road history that ultimately resulted in the West Orange Trail. You will come away understanding the history of the area. The town of Celebration is Disney’s pedestrian friendly planned community just south of the theme parks. This is a leisurely ride through the town’s trails, streets, and downtown, with time to visit the many shops. Bring the kids on this leisurely kid-friendly tour. 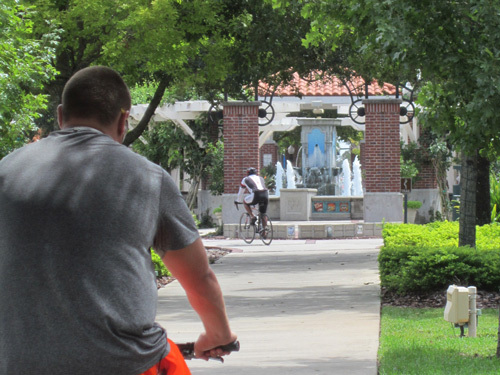 Ride along brick streets through Orlando’s most historic tree lined neighborhoods. This tour is led by a representative from Orlando’s Historic Preservation Board, and travels through the downtown area with views of many of the Orlando area’s early leaders homes and other sites. Click below to reserve your bike! Knowledgeable Tour guides and Bicycle transportation can be arranged for an additional fee.